February 2016: Unfortunately, Pitney Farm was lost forever due to a severe fire that investigators believed was intentionally set. The fire happened just months after the Friends of Pitney Farm successfully convinced the township to lease the house to their group and implement a plan for its use as a community arts and education center. The twelve-acre Pitney Farm is an excellent example of an eighteenth-century farmstead. The complex contains a Federal-style farmhouse with later additions, three barns, two cottages, an ice house, and several gardens. 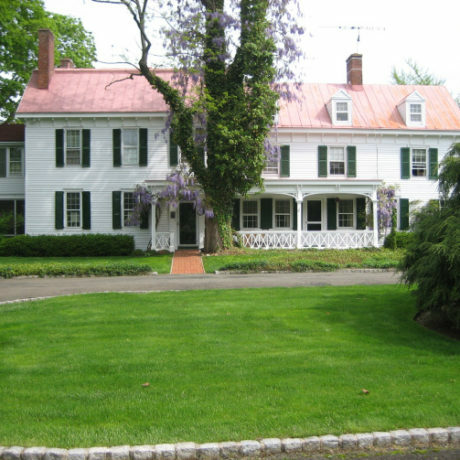 First developed around 1760, the farm remained in the Pitney family for two-and-one-half centuries – ten generations – before Mendham Township bought it in 2009. Over the years general farming gave way to specializations such as dairy farming, fruit orchards, and small vegetable gardens. Among the many notable Pitneys associated with the property are a Revolutionary War veteran and prominent lawyers and jurists, including Mahlon Pitney III who was nominated to the U.S. Supreme Court by President William H. Taft in 1912. In May 2014, a Public Purpose Study Committee created by the township recommended several courses of action by which the historic buildings and surrounding property could be used to serve the community. But in December, the Township Committee chose not to fund a historical study of the buildings and in mid-April voted to investigate the necessary steps to put the property up for public auction despite a local nonprofit, Friends of Pitney Farm, being willing to take the lead in developing the site for community purposes. Pitney Farm is a rare, largely-intact example of an eighteenth-century farm that provides a vivid picture of the evolution of farming and farm life in the Garden State. Preservation New Jersey encourages Mendham Township to vigorously pursue means to retain this special asset. A first step would be for the township to work with the Friends of Pitney Farm and transfer operations to their care. They could then pursue listing on the New Jersey and National Registers of Historic Places, which would create an opportunity for grants and private donations for the preservation and adaptive use of the property. The historical and cultural value of Pitney Farm gives it the potential to be a great asset; PNJ believes it must be protected.